This swimming pool mural was painted by hand, directly on to the walls. The mural, painted over four very large walls, took 25 weeks in total (including repainting half the mural again after structural change). Any quote for similar work would be based upon a similar timeframe, depending on the size, etc. Angkor Wat and the Ta Prohm Temple ruins complex in Cambodia covers an enormous site, with an incredible amount of sculpted detail, so in keeping with this awesome reality I have painted here an enormous Angkor jungle mural with lots of detail! Produced to transform a rather cold feeling indoor swimming pool area into a warm and welcoming haven of fun and relaxation, the original work took three months from conception to completion, and included remodelling of the jacuzzi and building a fiberglass tree! However, due to a new changing room being built and the old cubicles removed, I was called in to rework a large area of this mural. These pictures show the final result. all of which have been used for inspiration for this mural. Click on the coloured links for information from Wikipedia. Here you can see what the pool room looked like before all the work was done, including removing the jacuzzi, shower and changing cubicles and replacing with a new changing room. 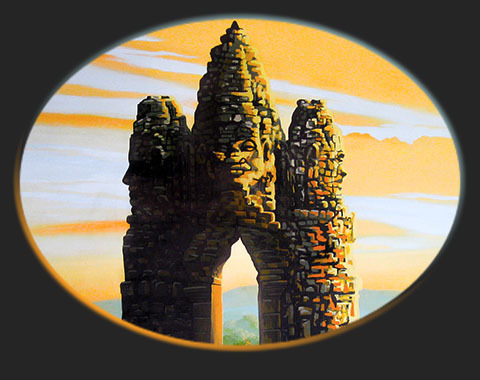 Angkor Wat Ta Prohm jungle temple mural, I painted an impressionistic view of the wonderful ruins on the new changing room. Light streams in through the double doors and the huge strangling roots of a silk-cotton tree slowly reclaim a doorway in the temple upon which it stands. View across the countryside at sunset and the Angkor wat Temple itself. ..oh, and we built a tree. This hand painted mural, painted over four very large walls, took 25 weeks in total (including repainting half the mural again after structural change). Any quote for similar work would be based upon a similar timeframe, depending on the size, etc.